In December I was brought in to work on a project with Charlie Dark, called Words on Walls, which was commissioned by Newham Council and the Discover Centre, Stratford. 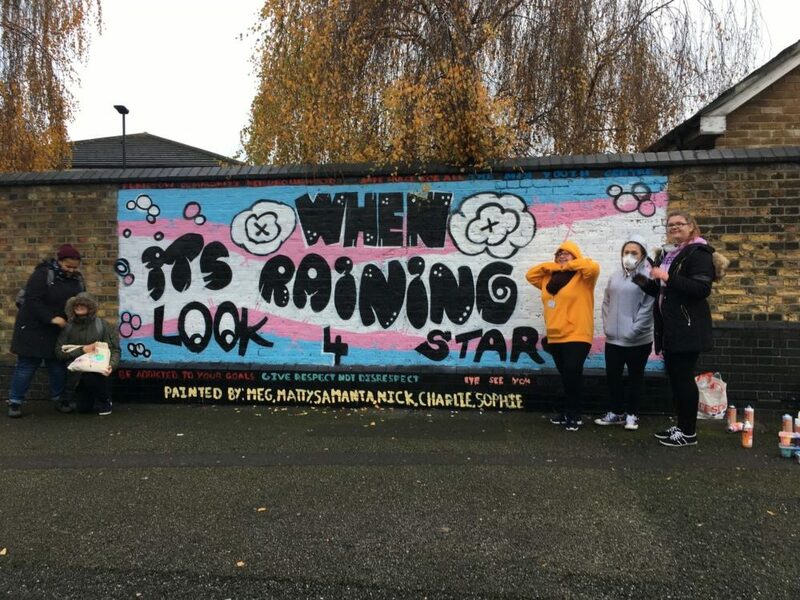 The aim was to work with “The Mix” who are a local LGBGT youth group in Plaistow, to provide a space to convey a phrase that inspired them and to enable them to learn the basics of mural design and painting their design. We gathered for a session to capture ideas, then met at the wall on a cold and rainy December afternoon, to get their plan painted. Big thanks to everyone that made this happen.. It was great to meet such a positive and confident group, and to work together to brighten up Barbers Alley. © 2019 pyklops ~ All rights reserved.